The prolific chef is behind the new Breva, the new Viale dei Romani, and the forthcoming Veranda, but he’s still focused on making The Tasting Kitchen great. 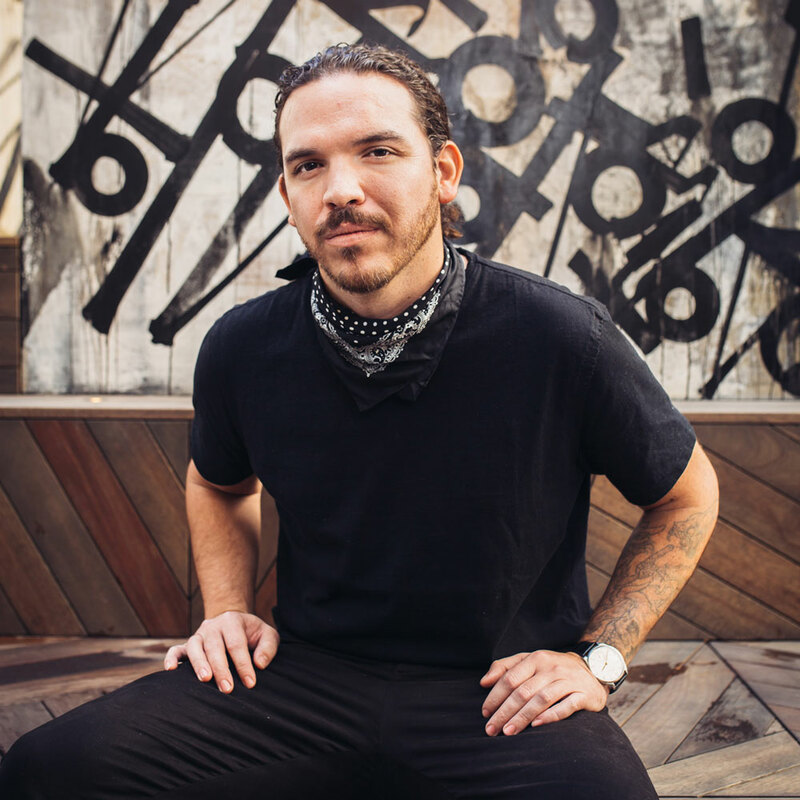 Chef Casey Lane went to San Sebastián when he was doing research for Breva, his restaurant in downtown L.A.’s newly restored Hotel Figueroa. He immediately saw similarities between the Basque resort town and Los Angeles. Like in L.A.’s Venice neighborhood, where Lane opened The Tasting Kitchen in 2009, San Sebastián has a lively skateboarding culture and a big surfing scene. “There’s very much this beach community vibe,” Lane says. But compared to L.A, San Sebastián stays up really late, which means that it likes to dine really late. In L.A., Lane correctly points out, it can be "borderline impossible” to get a great late-night meal. Yes, Lane loves going to after-hours taco trucks, and L.A. has an always-open Koreatown. But what he’s referring to are late-night places like downtown New York’s Blue Ribbon, Minetta Tavern, Raoul’s, and Employees Only, where you can enjoy comforting, polished, brasserie-style food long after most of the city is asleep. On many nights in L.A., that’s the kind of experience Lane craves. Lane was energized by being in San Sebastián, where many residents often seem to think that sleeping at night is optional. Lane and his crew visited bars and restaurants where they marveled at young revelers who would eat pintxos while standing up. Lane noticed older clientele feasting on “aggressively rich” food like cod cheeks in a pil pil sauce. There was often a party-hearty vibe in San Sebastián, but the food was made with care and full of flavor. Lane was totally down with how this city got down. 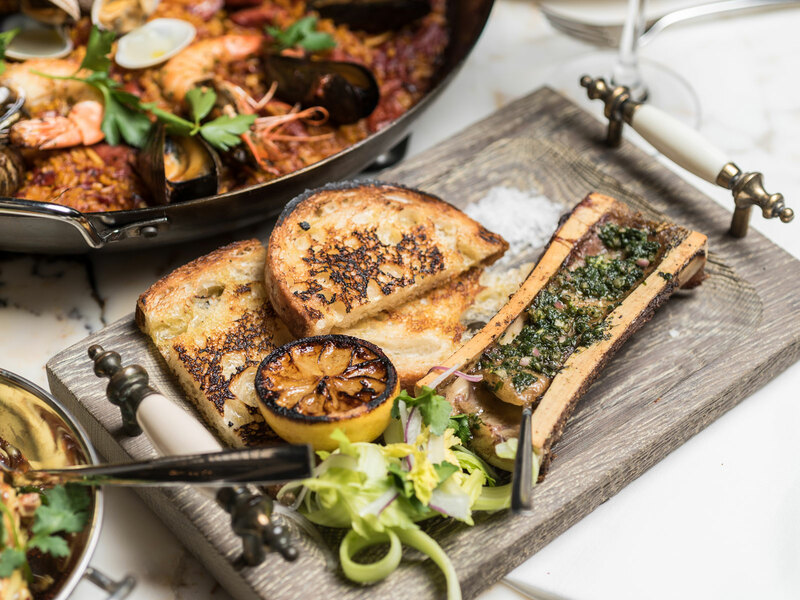 So Breva, a restaurant that Lane describes as a Basque brasserie, is where you can make an 11 p.m. Friday night reservation and have a splendid meal after a concert or Lakers game at the nearby Staples Center. You can start with bar snacks like grilled oysters, ham-and-cheese croquettes, and toast with a resplendent tomato gazpacho. There are Moorish spiced carrots, big pieces of bone marrow, and a gorgeous bowl of shellfish and chorizo. 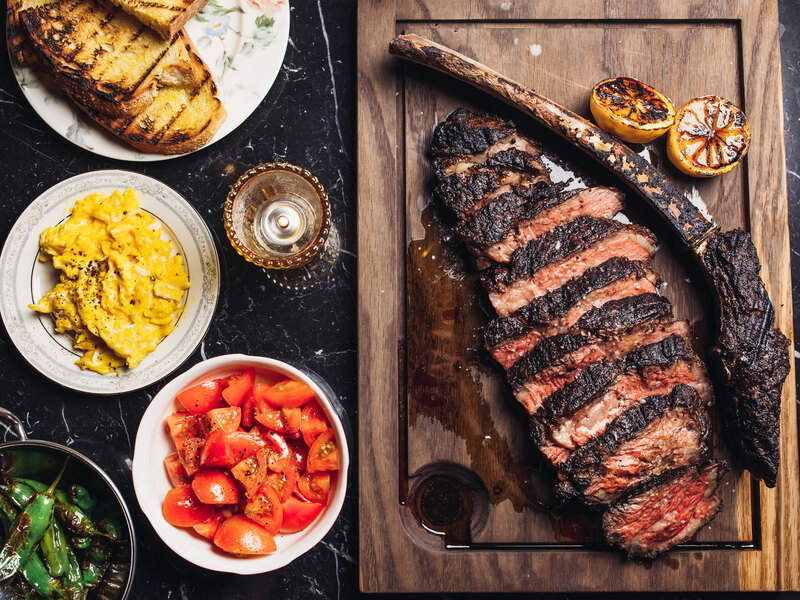 The 35-day dry-aged Huntington Meats ribeye has lovely funk and fat that’s balanced by sides of shishito peppers and perfect tomatoes. Not incidentally, Hotel Figueroa’s cocktails, including a collection of Spanish gin and tonics you can try at Breva, are the work of Employees Only founder Dushan Zaric. The 35-year-old Lane might be the busiest chef in L.A.. He opened Breva in February. He’s working on the imminent debut of Veranda, the poolside Mediterranean restaurant at Hotel Figueroa. He’s simultaneously running a new high-profile restaurant at another hotel: Viale dei Romani, which serves the finest crudos in L.A. and other beautiful Italian seafood dishes, opened at West Hollywood’s La Peer Hotel in January. Lane’s still actively involved in The Tasting Kitchen, where he continues to work on the daily menus, whether it’s in person, over the phone, or via 2 a.m. emails. “I can’t ever let go of The Tasting Kitchen for some reason,” Lane says. All of Lane’s restaurants stay open late, which is notable in a city where getting a good plate of pasta or a nice steak at 10 p.m. can be challenging. Lane says the goal of his hospitality company, From Scratch, is to eventually run its own boutique hotel. He wants to build experiences based on how he likes living. So Veranda will open at 7 a.m. because Lane enjoys eating breakfast by the pool. It will close at 2 a.m., because that’s as late as Lane can legally have it open. There will be flatbreads that Lane stresses are not pizzas. “It’s somewhere kind of in the middle of focaccia and actual bread,” he says. Lane thinks about nuances a lot when he cooks. He likes to blur the lines. He says he’s able to have all these restaurants because he and the staff he’s built out of all these years at The Tasting Kitchen have plenty of ideas that are based on heritage and personal history. Both Breva executive chef Josh Herlihy and Viale del Romani executive chef Brian Bornemann worked at The Tasting Kitchen and also helped Lane open Casa Apicii in New York’s Greenwich Village. Lane grew up in El Paso, Texas, where he enjoyed a lot of Mexican flavors. His mother and grandparents were from the South of France. His grandmother had Moroccan roots. His culinary training “was very Italian.” He was drawn to Italian food “because there was so much creation,” whether it was transforming muscles into salumis or turning dough into different pastas that varied greatly in texture. Lane’s first job out of culinary school was being a baker in Portland. He later left Portland to open The Tasting Kitchen. He was a 26 year old who, with help from friends he had brought over from Portland, became a pioneer in L.A. 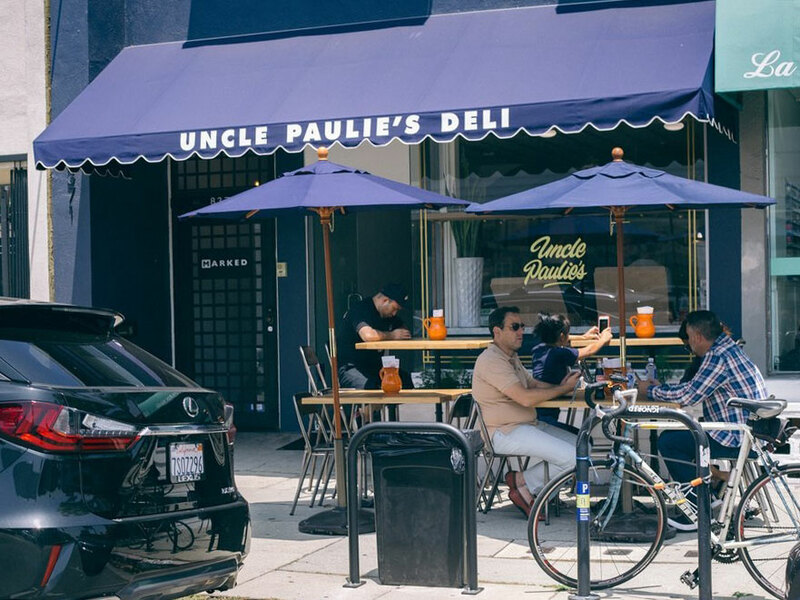 He was a driving force behind Venice’s Abbot Kinney Boulevard turning into one of the buzziest dining corridors in the entire country. For the first year of The Tasting Kitchen, Lane and his staff went to farmers markets every day of the week and wrote menus based on what they had enough of to get through dinner service. “We were so inspired to get our chance to do our thing at that time,” Lane says. The Tasting Kitchen became a sensation by deftly preparing Italian classics like bucatini all’amatriciana while also opening up the spice cabinet for hybrid dishes like a merguez crepinette with caramelized carrots, oil-cured olives, and harissa vinaigrette. Lane thinks a lot about migration patterns and how they affect food. The texture of America and the texture of L.A. specifically are also part of Lane’s restaurants, of course. Viale dei Romani serves delicate, perfectly composed crudos like day-boat scallops with yuzu, fennel, and pink peppercorns. Uni is adorned with Thai basil and serrano chiles. A dazzling shrimp crudo pops with tangerine, pickled Fresno chiles, and mandarinquat. These crudos might be inspired by the Italian coast, but they’re also pure L.A, influenced both by local ingredients and flavors from all over. So there’s a large-format chicken tagine. There’s wood-roasted market fish with couscous, chermoula, and spiced yogurt. And then there’s Viale dei Romani’s remarkable saffron fried rice with three kinds of clams plus fideos, garlic, parsley, and aioli. Sauteed rice is something that all kinds of cultures have served forever, so Lane’s offering it with a flavor combination he favors. 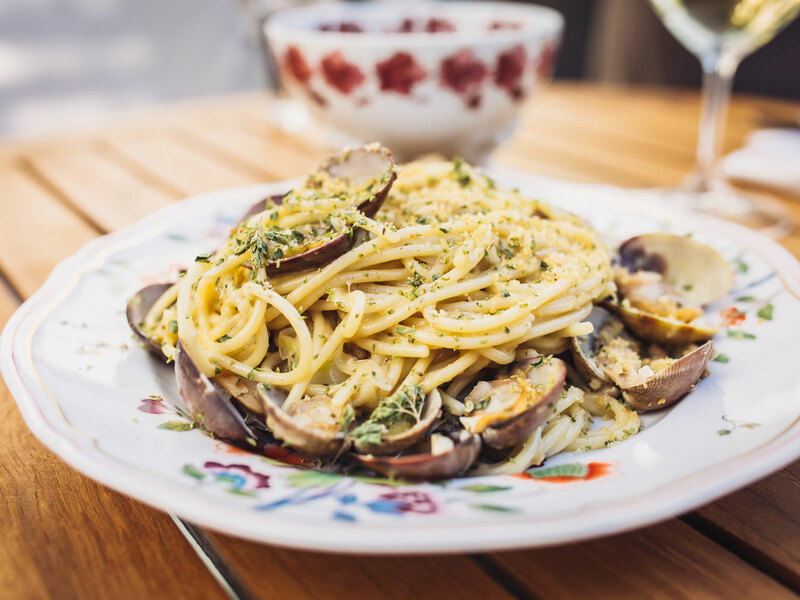 Viale dei Romani’s exemplary spaghetti with clams, playfully known as “the spaghetti clam show,” also features three kinds of clams. There’s no elevator pitch for what Lane’s doing. “Even just the concepts of restaurants, it makes me crazy,” he says. For example, he doesn’t like the word tapas and won’t use it to describe Breva even though Hotel Figueroa’s own website does that. Lane is the type of chef who like to cook without limits, so he’s not one to narrow down his ambitions. But on one level, Lane’s goal is simple. He wants to create neighborhood restaurants. He wants to create restaurants that recognize the rhythms of life and how people wish to dine at different times and on different nights. Lane thinks about all the times he’s wanted to dine late in L.A. and been denied.